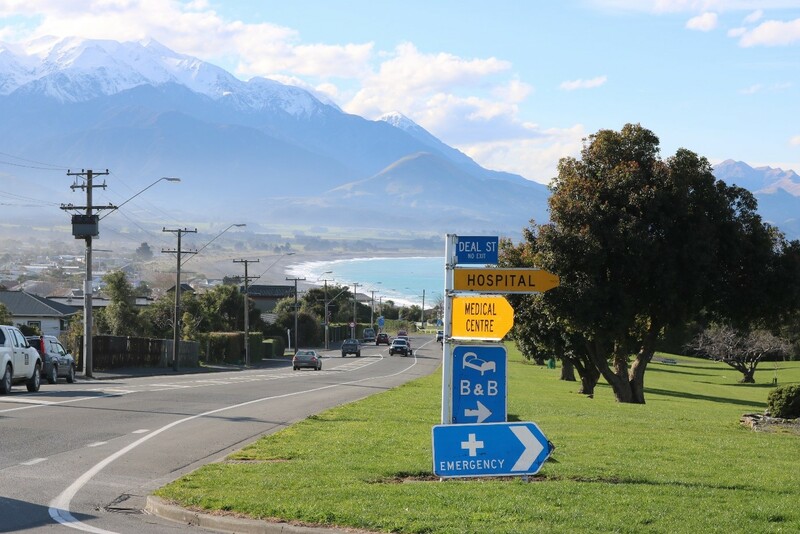 Beautiful Kaikōura is thriving, the coast road is open, and the tourists are back. All it needs is a brace of new GPs to work in its new integrated Kaikōura Health Centre, Te Hā o Te Ora, taking pride of place on the hilltop beside Takahanga Marae. This is a chance to work alongside two very experienced rural hospital doctors: Andrea Judd and Chris Henry who have been working at Kaikōura for 25 and 15 years respectively. “That’s the joy of the work: we’re generalists, but the skill mix is quite difficult to recruit to – it’s a broad scope ” he says. “You’re not going to be dealing with it on your own: you have very experienced backup.” On cue, the rescue helicopter thundered overhead, landing to pick up a stroke patient that Andrea had spent the morning stabilising after responding to the PRIME red callout. Kaikōura is well-known for its picture postcard scenery, fresh seafood and welcoming residents. So the work is interesting, but what about the place? It took me only two hours to drive from Blenheim to this iconic Kiwi coastal town, encircled by snowy mountains, pastures and ocean. I can report that the new road is fantastic: only two stops of a few minutes through roadworks, which passed quickly with oohs and ahhs at the sculpted hillsides. The town has recovered amazingly well, nearly two years on from the 7.8 Kaikōura earthquake. Going by the number of campervans, and tourists strolling around on a mild, showery midwinter day, Kaikōura is definitely back on the map for its famous whale-watching, seal-spotting, surfing and swimming with dolphins. The shops, cafes, motels, campground, i-SITE and library are open and busy, and there are firm plans for a new-build waterfront Sudima hotel and a community recreation centre with pool. With four primary schools and a high school, fishing, diving, and ski-ing and vineyards not far away, and median house prices at $406,000 (with big sections), what’s not to like? Health Services manager Angela Blunt says that the health centre provides for a community of about 5,000, with 3,850 registered patients, and 900,000 visitors a year.